Questions or comments about the site can be sent to the webmaster. In WolfTeam you can have up to 4 sets of weapons. The first set is your default weapons and you can always use these anytime. The others sets you can create and modify what weapons you want to use for your inventory. These sets you create require "WP" in game to use them. You can see here to the left are all the weapons you own in your Inventory, sorted by type. To the left you see up to four sets of weapons in your WP Equipment. The first is the Standard Default Weapons and you can see there is no WP requirement to use this set in game. In this second picture we are looking at your third WP set "WP 2".You can customize what weapons from your inventory you want to place in this set. By placing the "XEM-8 WT" gun in the set you add 595 WP and by adding the "MK-5 G" grenade you add an additional 40 WP. The total for this set you have created would be 635 WP as seen at the top. WP is what you earn in game and each game it resets. You get 50 WP for selecting your default weapons or Wolf, you earn more WP by killing opponents, capturing basses or planting/defusing bombs. You can also get WP by preforming combo kills and making "headshots" or killing the top player in that game and various other bonuses. You use your WP to select your purchased and equipped equipment. The cost varies and you can see before hand in your inventory how much it will cost to select that group when you are in game. 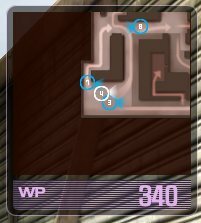 You can see how much WP you have by looking in the top right corner when you are playing in a game. You can see an example in the picture to the left. In this final picture you can see all your Sets in game. This is where you make your selection of what Set you want to use this round. You can see your Standard Set requires no WP to use, in fact it actually gives you 50 WP for using that set. You can also see your "WP 2" Set you created available, you will notice however that it is Greyed Out as you do not have enough WP so you cannot use it until you get at least 635 WP.